Ok, after my recent forays into the emotional minefields of optimism and enthusiasm, it’s back to what I do best – being a miserable old killjoy. 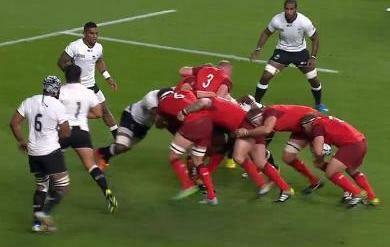 My gripe today is that old favourite – the "truck and trailer" driving maul. Don’t get me wrong – I'm as big a fan as the next man of up-the-jumper rugby and a well-executed driving maul, with the ball smuggled to the player at the back of a pack all properly bound and driving forward can (to me at least) be a thing of beauty. My problem is that virtually every driving maul I see these days is not being properly policed by the referee. Watch any driving maul from a lineout. The ball is caught and moved to a supporting player with a number of players joining the maul in front of that player (offside) while others join adjacent to or behind. The player in question then releases or loosens his bind and manoeuvres himself (rather than the ball) to the rear of the maul, ball in hand – effectively using the (offside) players in front as a screen as the whole edifice rumbles forward. A proper, legal driving maul is difficult to perfect (as it should be) but, by choosing to ignore certain laws of the game, referees are making the driving maul all too easy for the team in possession and more or less impossible to defend against without infringing, the result being that scoring tries from driving mauls has become way too straightforward (well, not for England, perhaps, but let’s not go there).